Record book is 78 full color pages, easy fill in format; Measures 9" x 1125". Arrives packaged in a white frosted polypropylene box, easy to wrap or just tie a ribbon for easy gift giving. Record all the precious moments of your baby with Pepper Pot Record Book. The addition of a new baby is one of life's greatest joys. Record all the precious moments with a brag book, album, memory book, or other item from one of Pepperpot's adorable baby collections. Quintessentially baby, and irresistibly cute, these keepsakes promise to be a delight to share now and for generations to come. Pepperpot addresses life's most joyous occasions, weddings and babies as well as providing practical yet stylish items to entertain children, dress up a kitchen, brighten travel, and record precious memories. A division of The Gift Wrap Company, we partner to bring quality and style to the special occasions in your life. 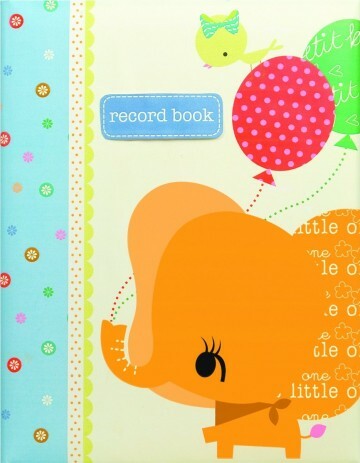 - Record book is 78 full color pages, easy fill in format; Measures 9" x 1125"
Love love love this baby book! I looked through probably 30 baby books, I saw this one online and LOVED it. I took a risk, since there weren't many reviews telling about what pages are included, and I am so glad I did. This book includes everything you need and want in a baby book; parent info, all about baby, baby's firsts and all the way up to 5yrs of info. It even includes an immunization records page. Plus, the pages are really cute. These books are incredibly cute, impressively comprehensive, and make record keeping easy and fun. Make sure you order it well before your due date so you can fill in some of the information in advance and also so you can have it ready for getting hand and footprints after delivery. This product was exactly as described. And it is made sturdy. Very cute and perfect for what I'm looking for.